If you’re looking for a vehicle that comes from a trusted name and has the amenities to rival a new car, look no further than the Volkswagen Jetta Wolfsburg Edition. This car comes with top-of-the-line safety features, plenty of storage and optimized temperature control. Plus, if you’re wary of purchasing a used vehicle, you can always check its history on Carfax to ensure it doesn’t have a past riddled with maintenance and collisions. What distinguishes a Volkswagen Jetta Wolfsburg Edition from a regular Volkswagen Jetta is that is has sport front seats, 16” wheels, power windows and mirrors, and a CD player. The Volkswagen Jetta Wolfsburg Edition also comes with cargo tie downs, which are optimal for transporting recreational equipment. You don’t ever have to worry about breaking fragile items in the trunk, especially since you have a cargo area light to illuminate objects at night. On top of that, front and rear splashguards keep your vehicle looking brand new. You can add on a Jetta ground effects kit to really get the most of your Volkswagen Jetta Wolfsburg Edition. A rear spoiler, rubber floor mats (vinyl optional), and a trunk liner all work to give this vehicle a sense of luxury that’s rare. There’s no need to worry about allergies, since this model also comes with an air filtration system. You control the temperature in this vehicle optimized for minute temperature manipulation. Air conditioning is located in the front and rear of the vehicle (second row). The center console at the front of the vehicle comes with storage for your insurance information, spare napkins in case of accidents, or extra change. Long road trips are a breeze with cruise control. Concentrate on steering and let your Volkswagen Jetta Wolfsburg Edition do the rest. This blog post offers benefits to using cruise control, with number one being its cost-effectiveness. By setting your cruise control at the speed limit, you avoid speeding tickets and the auto insurance price spikes that come with them. In addition, you save on gas by limiting the amount of fuel your engine receives. Reducing acceleration and deceleration really does help you save money. Convenient cup holders in the front and rear of your Volkswagen Jetta Wolfsburg Edition make happy hour visits to Sonic easier than ever. A multi-function remote gives you keyless entry and immediate trunk release. You can charge your devices as well, since it comes with a 12v power outlet in the front and cargo area. No more arguing over who gets to charge their phone first, and you can even enhance the sound system by plugging in your own speakers! Reading lights in the front, a tilt and telescopic steering wheel, and door pocket storage also up the convenience factor. There’s even a grocery bag holder to make your shopping experience hassle-free. Vanity mirrors with a dual illuminating feature are great for people who are always running late—you can quickly do your makeup in the car before leaving. The dashboard in a Volkswagen Jetta Wolfsburg Edition includes several features that make it perfect for road trips or that boring morning commute. A CD player is included if you want to throwback your Thursday with some Britney Spears or Backstreet Boys albums, and MP3 playback (auxiliary audio input) allows you to play the hits from today. An AM/FM Radio lets you tune into your favorite stations. Your music will sound great with 8 premium speakers. You get warnings and reminders on your dashboard for tire fills and low fuel level. A clock ensures you’re never late to an appointment and an external temperature display is great for traveling long distances where weather changes are drastic. The tires on a Volkswagen Jetta Wolfsburg Edition are all season, and a tire pressure monitoring system keeps you and your car on the same page. The moonroof/sunroof is made of power glass and is remotely operated. Fully enjoy your environment with access to fresh air and the stars. Power widows are remotely operated (no cranks! ), and window defogger in the rear gives you full visibility. Intermittent front wipers and heated windshield washer jets aid in inclement weather conditions. Safety is key in a Volkswagen Jetta Wolfsburg Edition. It comes with active head restraints, an occupant sensing passenger airbag deactivation, an anti-theft system with an alarm remote and engine immobilizer, child safety door locks and seat anchors, and emergency interior trunk release. Tack on rear side airbags, side curtain airbags, and side mirrors that adjust to your exact specification and heat up in the winter and you have a vehicle designed for safety. The driver has true control in a Volkswagen Jetta Wolfsburg Edition. The heated driver’s seat keeps you warm and toasty in the cold months, and eight manual adjustments (including height and lumbar) ensure your seat is as comfortable as possible and your view is as clear as possible. The passenger seat also benefits from these features. Extra amenities include four doors for optimal unloading and loading (bring your friends! ), 4-wheel ABS brakes, automatic transmission, a chrome grill, daytime running lights and front-wheel drive. Your overhead console in Volkswagen Jetta Wolfsburg Edition includes extra storage space for sunglasses and privacy/tinted glass. When you look under the hood, you’ll find an engine with 150 horsepower and a 2.5 liter incline with 5 cylinders. It also boasts stability control, a tachometer, and traction control with ABS and driveline. The fuel economy is great, with 30 miles to the gallon on highway driving and 22 in city driving. New features in the fifth generation of the Jetta include a body made of high strength steel, increased laser welding, increased torsional rigidity, and an impact-absorbing front bumper. Safety was strengthened with side curtain airbags and an Electronic Stability Programme with anti-slip regualton and brake assist. Also added were active head restraints, direct-shift gearbox transmission, dual-zone automatic climate control, and electro-mechanical power steering. Upgraded in the fifth generation is a redesigned electrical system. Control modules transmit over Controller Area Network buses, and transmission of signals takes place digitally to reduce on errors. The Jetta received a ‘good’ safety rating from the Insurance Institute for Highway Safety for front offset and side impact tests. In 2006, it received ‘top safety pick’ recognition from the Institute, prompting the company to release several commercials focused on the safety of the vehicle. In these commercials, the tagline ‘safe happens’ appeared on screen after passengers emerged unscathed from a Jetta that had just undergone a terrible collision. The car received 4.4/5 star review from Edmunds.com. You can choose from several accessories to make your Volkswagen Jetta Wolfsburg Edition uniquely you. Black and yellow seat covers can you give your vehicle that sports car feel and car organizers ensure your items never get misplaced. Dash covers are perfect for controlling the temperature of your dashboard and keeping it clean. Cargo liners also work to keep your interior looking brand new. Sun shades regulate the temperature of your car as well, keeping the interior cool in the summer, even if you’re parked in the sun. If you want to go all out, custom gauges let you choose which information means the most to you and enhance that gauge visually. Before you purchase a pre-owned Volkswagen Jetta though, it’s important to know a little bit about the manufacturer you’re buying from. Volkswagen was founded in Germany in 1937 and is currently the largest automaker worldwide. The company began as a way for working class people to afford cars, since at the time, vehicles in Germany were considered a luxury and only owned by 1 in 50 German citizens. It was originally called a ‘people’s car’ project, so you know that their intentions are to provide quality vehicles at a price people can afford. The Jetta is their top-selling model, with over 10 million produced and sold all over the world. If you’re unsure about purchasing this model pre-owned, check out this article that lays out all the reasons why buying a car used makes so much more sense than purchasing a new vehicle. For one, used cars have a cheaper price tag, meaning it will have less depreciation. You’ll also avoid the high sales taxes that you have to pay on new vehicles. You’ll also not have to pay as much for your registration fee since it’s based on the price you paid for your car. You can also avoid ‘dealer fees’ that tack on hundreds of dollars with absolutely nothing to show for it. As if that wasn’t enough, you’ll also save on insurance costs since your car isn’t worth as much as a new vehicle. Purchasing a used vehicle is an investment that will pay off a hundred-fold. 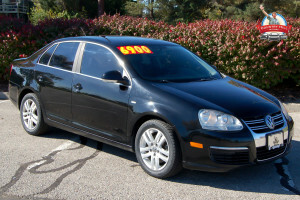 You can purchase a pre-owned 2007 Volkswagen Jetta Wolfsburg Edition from Country Hill Motors and experience all these features for yourself. Our Sales Associates would be happy to assist you in choosing the pre-owned vehicle that fits your exact needs, so come by a location near you today and get started.